ASTORIA – On a still sunny fall day, two women sit in the grass by the Columbia River to eat their lunch: cheesy potatoes, cooked carrots and chicken. The meal is supplied by Filling Empty Bellies, a nonprofit that serves lunches to people in need six days a week in Astoria’s People’s Park. The park is unidentified and is easily overlooked as green space along the Astoria Riverwalk and across from the tourist-filled Mo’s Restaurant, which opened a year ago. The two women, who asked not to be identified, are housed – although unstably so. One is couch surfing; the other recently moved off the street and in with a partner. They both pay rent and work, one full time in the service industry, the other part time in retail. Both women are pregnant. With nearly 10,000 residents, Astoria is the most populated town in Clatsop County, which also includes Warrenton, Hammond, Gearhart, Seaside and Cannon Beach. The effects of the statewide housing crisis and a rise in homelessness are felt acutely in Clatsop County, where a low-vacancy rental market has long outpaced wages for a coastal economy in transition. Industries such as forestry and fishing, which have sustained the settlement of Chinook land at the mouth of the Columbia River for the past 200 years, is giving way to tourism and a service-industry-based economy. With a median income of $47,000 in Clatsop County, affordable housing – that which is accessible at 60 percent of the median income – would be around $700-$800 a month. However, it is difficult to find a two-bedroom apartment for less than $1,000, with listings most commonly around $1,200 to $1,400. Instances of people falling into homelessness in Clatsop County are also on the rise. According to the 2017 Point in Time Count, Clatsop County has the fifth-largest homeless population in the state – behind some of Oregon’s most populous counties: Multnomah, Lane, Marion and Deschutes. 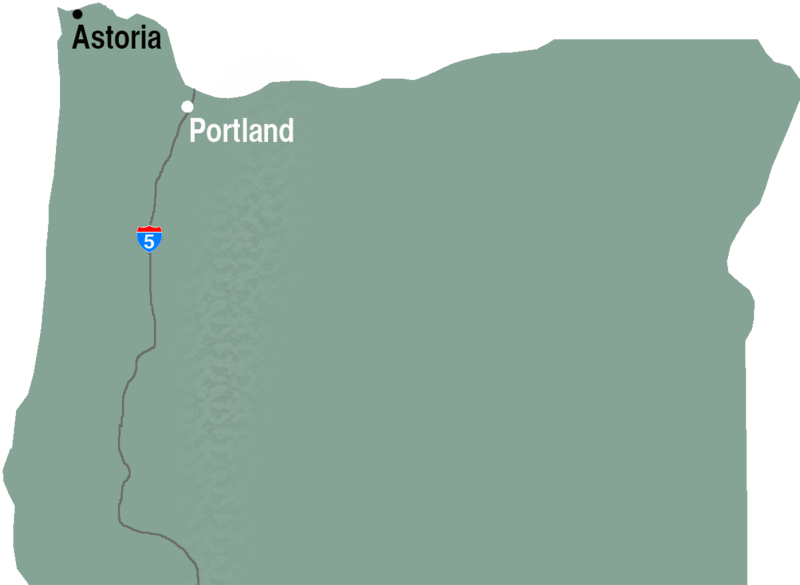 Clatsop – the state’s 19th-largest county, with a population just over 39,000 – counted nearly 700 people experiencing homelessness, or 5.7 percent of residents. The two women eating lunch discuss barriers they have faced trying to secure long-term housing: coming up short on the monthly income requirements or having to report a misdemeanor charge on rental applications, for example. They both qualify for Section 8 Housing Choice Vouchers, but long waitlists make that housing option feel so far into the future as to be impossible. The woman who is couch surfing and working full time has her brow furrowed in a perpetual state of worry. She grew up in the area but cannot afford market rent working minimum wage, even full time. Low vacancy rates in Clatsop County are especially difficult to navigate in Astoria, which has a higher rental market than neighboring Warrenton or Seaside. However, Astoria is the county seat and the location of many services, including the Social Security office and the state Department of Human Services, making it a necessary place to be for those who access those services. Both women say they rely on lunches from Filling Empty Bellies because they cannot always afford groceries. Erin Hofseth, director of Filling Empty Bellies, said this scenario is typical. On a typical day, Filling Empty Bellies can serve up to roughly 50 people, both housed and unhoused. No one is turned away. Lunch is served by volunteers who sign up through the organization’s Facebook page, and food is either donated from local businesses or supplied by funds from the organization, which come in mostly through private donations. Filling Empty Bellies was founded four years ago when Clatsop County resident Corri Buck began making sandwiches and driving around in her car to find people in the county who were hungry. It has now grown to more than 400 volunteers and has served approximately 50,000 meals. A year ago, it received its 501(c)(3) tax-exempt status with help from Hofseth, who was working on her master’s degree and volunteering with the organization as part of her thesis. In addition to meals, Filling Empty Bellies has become a catch-all for resources and support for people in Astoria and Warrenton, facilitating laundry service and handing out sleeping bags, tents, blankets and clothing. It has sponsored several Haircuts for the Homeless events, served holiday meals, and made numerous housing and job referrals. Without a brick-and-mortar facility to house the operation, donations are administered out of cars and communicated through Facebook and word of mouth. Vernon Hall, a street advocate who has been involved with the organization since the beginning, said he feels blessed by the outcomes of the program. Hall has his own history with homelessness. Were it not for recently securing studio housing with his employer, this would have been his fifth winter outside in Astoria. Before Filling Empty Bellies, he said, there was nowhere to get a good meal outside of the holiday season. Beyond the meals, he credits the organization as a platform that has connected people across class and circumstance, and he said he sees more people reaching out to support those in need than he used to. Filling Empty Bellies’ focus on direct, low-barrier services and a lack of bureaucracy has fostered trust and relationship building among north Clatsop County’s struggling communities. For many, Filling Empty Bellies has become family. This is especially true for those who don’t have familial support, which Hofseth said is all too common. She talks about one participant who grew up in the foster care system and, as a result, has no family to help him while he works to get on his feet after spending time in jail and losing custody of his daughter. He schedules his visitations with his daughter at Filling Empty Bellies’ lunches. Early in 2018, Filling Empty Bellies began fundraising efforts to open a drop-in and resource center as a way to house its services and also to offer people on the street a place to go during the day. While it was successful in raising money, challenges have prevented the dream from reaching fruition. Securing a building has been difficult, in part because of the struggle to get a landlord to work with them because of the population they serve. While more people may be volunteering to serve lunch, attitudes in Clatsop County around homelessness and service providers are varied, with many balking at the idea of what's been described as an “enabling service.” While there is ample community support for community action organizations such as Clatsop Community Action – a housing, energy assistance and food bank nonprofit – or Helping Hands – a sober living emergency shelter and re-entry program – many draw the line at what they consider to be “handouts” – in this case, free meals. In a recent, locally viral Facebook post, Astoria business owners and other residents voiced complaints about people who convene and loiter in business doorways. In the comments, the accusation was made that Filling Empty Bellies is responsible for Astoria’s rise in homelessness because it was believed their services attracted people from Portland. A common belief in the county is that agencies or organizations in Portland are busing homeless people to Astoria to get them out of the city. In 2016, the city of Portland launched its Ticket Home pilot project, providing bus tickets to unhoused people who had arranged to live elsewhere. However, according to data provided to Street Roots last year by Portland and Multnomah County’s Joint Office of Homeless Services, rural Oregon cities were not seeing an influx of travelers from the program. Another challenge to opening a drop-in center has been physical and emotional burnout. 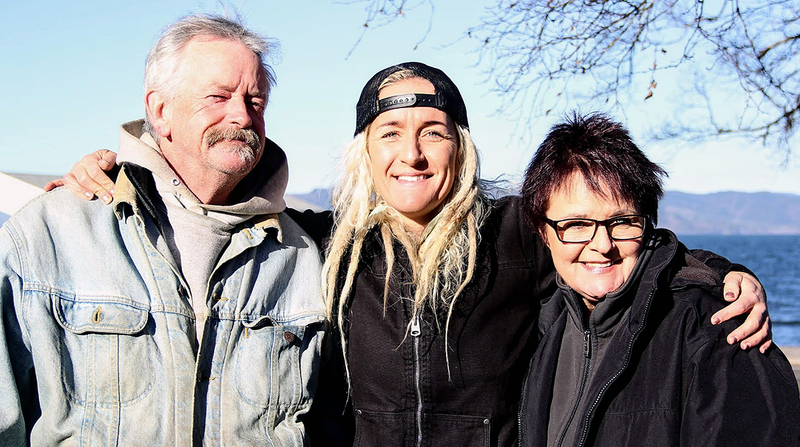 Buck, Hofseth and Hall have been the catalyst for so much of the organization’s growth but have been stretched beyond their limits as they continue to support a growing population in need alongside community backlash. Hall, who was formerly on the board of directors, stepped down because meetings cut short his valuable working hours. Last winter, Buck, who has taken the bulk of the abuse and criticism from those who oppose her efforts, stepped down as co-director. Hofseth is also working to reprioritize her time and efforts. A year after finishing her master’s degree, she found other work. She still finds time to maintain her role as director but relies on volunteers to keep the lunches happening. The ability to fill the monthly calendar ebbs and flows. Vernon Hall (from left) is a street advocate who is involved with Filling Empty Bellies. Erin Hofseth is director of the nonprofit, and Corri Buck founded the organization. However long it takes to make a drop-in center a reality, a location move is on the horizon. This summer, the Astoria Scandinavian Heritage Association plans to break ground on a Scandinavian Heritage Park at the site of People’s Park. At least for the duration of construction, Filling Empty Bellies will have to relocate. It is only speculation as to what the public sentiment would be if Filling Empty Bellies resumed lunches at the site after the completion of the park; however, a key reason People’s Park has been successful for Filling Empty Bellies has been its lack of use by the rest of the public and its slightly out-of-downtown location. Hofseth shrugs off park construction the same way she shrugs off the program’s naysayers. After lunch, people move fairly quickly to clean up – paper plates are put in the trash, volunteers hand out whatever food people can easily take away, and participants pack up their gear for the next phase of the day. The two women discussing their situation are both on their way to work. For the moment, People’s Park returns to being a nondescript strip of grass, trees and cement between road and river, and Filling Empty Bellies looks ahead to its next meal and its next move.